This morning I awoke with all good intentions of kneading a few pounds of pizza dough and inviting over some friends with lots of kids. But instead, good intentions and all, I found myself still shopping at 3:00 PM at my local supermarket. My friends, well they too had other plans and simply asked for rain check. Bread making was not going to happen to day. But I was still in the mood for some homemade pizza. So I thought up a plan 'B' . Whatever I came up with, I knew that I had to be quick. The fan club was potentially inviting a small crew of growing teenagers to help with the eating so I just could not anyone down. I thought: what if cheated by starting with a few fresh baguettes and turned them quickly into crunchy 'pizzette', full of taste. I small bakery in Italy used to do that on Wednesday evenings with their 'filoni' breads. I scrambled for the bread isle, et volia' , the baguettes were there, waiting for me, standing tall in a beautiful wicker basket. They were fresh , they were light and they were very crispy (thank you Chabaso Breads !). 'Pick me, pick me !' , they all screamed. Next find some fresh mozzarella. Well that was easy. And as to the tomato sauce, well that was even easier: my Italian pantry was very well stocked of this prime ingredient. Not much here. Pre-heat your oven to 450F. Slice the baguettes through the middle and in half. Place on a rectangular baking tray covered with foil. 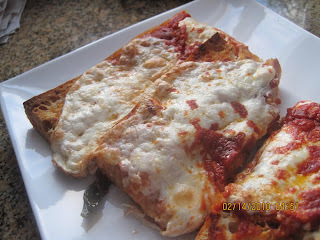 Top the bread slices with with your favorite pizza sauce recipe. Then generously sprinkle with grated Pecorino Romano cheese, cover with sliced fresh mozzarella and additional sauce. Bake until cheese melts and starts to brown.